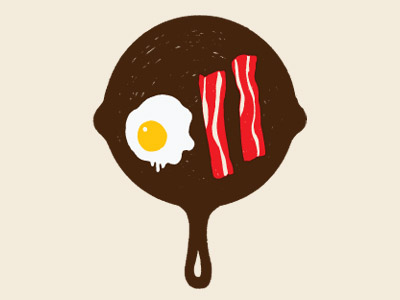 Bacon and eggs were not something my parents made for breakfast. Instead, despite my mother being a nutritionist, breakfast in our house included a rotating cast of microwaveable churros, grocery store pumpkin pie and apple strudels, and Toaster Strudels. With the icing packets. Yet no artificially colored cereals! (Which is why I now buy Lucky Charms from time to time.) Or snacks! So no Fruit Roll-Ups or Gushers in my Little Mermaid lunchkit. You might think someone in elementary school would be all over the Toaster Strudel, but for whatever reason I never had an appetite for breakfast (this continued through college) and would convince my dad to let me take it to go (like, on the school bus) and then proceeded to throw my breakfast away at the first trash can I saw. Of course now I feel incredibly guilty. On weekends, still no bacon and eggs, or pancakes and waffles, obviously, but my mom might make her vinegar and soy sauce eggs or my dad would make a pot of glutinous rice balls filled with sesame paste or his flavorless boiled sweet potato. Yes, my dad cooks. In fact, in my memory, he cooked most weekday nights, whereas my mom cooked more often for special occasions. When we had guests, she was more in the kitchen than at the dining table and eventually reappeared with the shrimp—always the last dish, always hot—and would finally stay a while. Shortly thereafter I would excuse myself and whip out one of my more advanced Chinese phrases, which translated to something like "I'm leaving, but you should stay as long as you want and eat slowly." My parents' friends were always impressed by this. 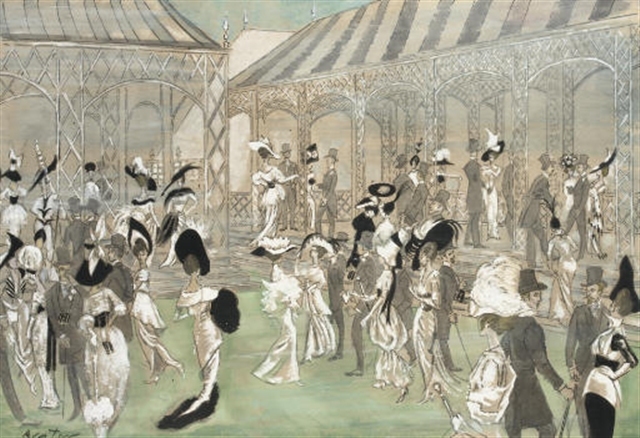 CECIL BEATON'S SKETCH FOR MY FAIR LADY. IMAGE VIA HATSANDVEILS.NET. There are so many good classic films I have yet to see and, until this week, My Fair Lady was one of them. Lucky me, I got to see it at The Music Center's Dorothy Chandler Pavilion, which opened the same year the film was released (1964) and where, I'd like to point out, the Oscars were held several times. Looking back on the last five months, I realize I've learned a lot about Los Angeles and its modern (and not-so-modern) architecture through working with the Conservancy and taking its Modern Skyline and Modern by Moonlight Walking Tours of Bunker Hill. Coincidentally, Design Agency Co is located on Bunker Hill, in the old Subway Terminal Building, and having promoted and taken these tours myself, my experience of the neighborhood is that much more meaningful. With the makeover of Grand Central Market, the City's largest and oldest public market, and Urban Outfitters making a home in the historic Rialto Theatre later this year, it's certainly an interesting time to be working in Downtown LA. 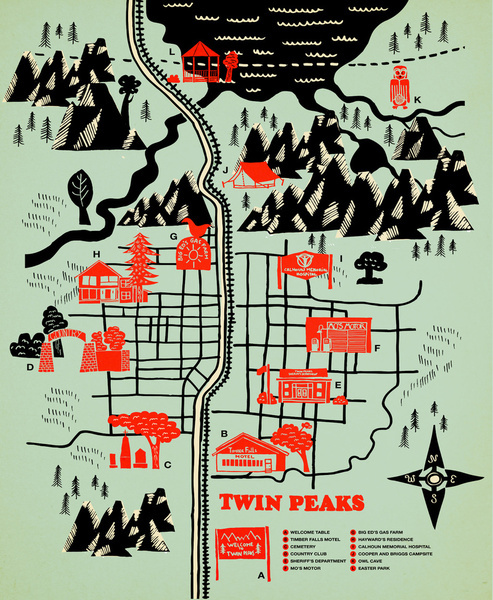 Twin Peaks Map by Robert Farkas. When I come across Cool Things (in this case, on Design Milk) like the above TWIN PEAKS MAP (!! ), I don't know if I should buy it for myself or for one of my Twin Peaks-obsessed friends. If I bought it for myself I would have a really cool poster. Plus, it would go well with the apartment's Sol LeWitt walls (another post for another time). But if I bought it for a friend, well, that would make me a pretty cool friend. But now that I've shared it here, chances are I'll neither buy it for myself nor for anyone else. In fact, by the time I publish this post, it will quickly be relegated to the ranks of soon-to-be-forgotten Internet finds. Depressing, I know. Having always liked broccoli's resemblance to trees (I guess that makes cauliflower winter trees) and probably because I went to architecture school, I couldn't resist posting this photo. I came across it in a slideshow that accompanies yesterday's Slate article, "Why Broccoli?" by friend L.V. Anderson, who you may know as the woman behind the blog A Temporary Omnivore in Paris. The slideshow, which includes a photo of Barbara Bush holding a broccoli stalk around the time her husband declared, "I'm president of the United States, and I'm not going to eat any more broccoli," was compiled to restore our faith in broccoli, should recent broccoli slander have lowered our opinions of the vegetable. 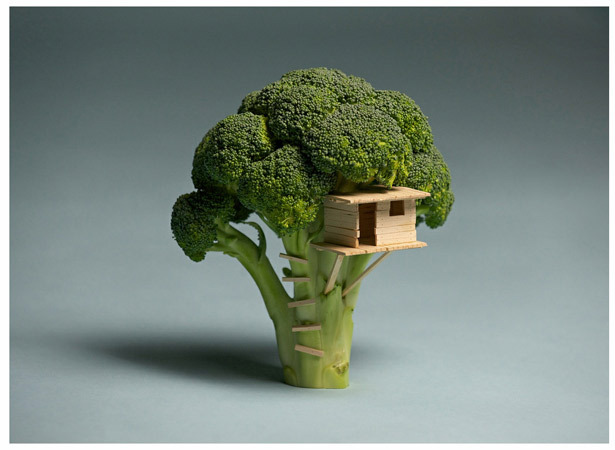 The caption: "Ironically, even when broccoli is being slandered as a socialist, no one cites its housing potential for the needy and very tiny." Anyway, read L.V. Anderson's article. COSTA MESA - A foodie or gourmet I am not. A gourmand—perhaps. Mostly because I enjoy eating and tend to overeat. Take this afternoon, for example: I wasn't particularly hungry but because it was on the way home, I stopped at East Borough at The Camp and ordered not one, but two items from the menu. Having already tried the Vietnamese Ham Bánh Mì (with pâté, which you have to request) and Bò Kho Beef Stew Baguette—consecutively and in that order—I opted for the Vietnamese Pork Loaf Bánh Mì and, because I can never order just one thing, the Tofu Spring Roll. And lucky me (and you and everyone else), if you check in on Yelp!, you get two dollars off one of their bevs. According to the cashier, as long as I keep checking in, I can keep getting the discount. If you're a social media zombie, you'd probably appreciate their entire webpage dedicated to social media, including Instagram. 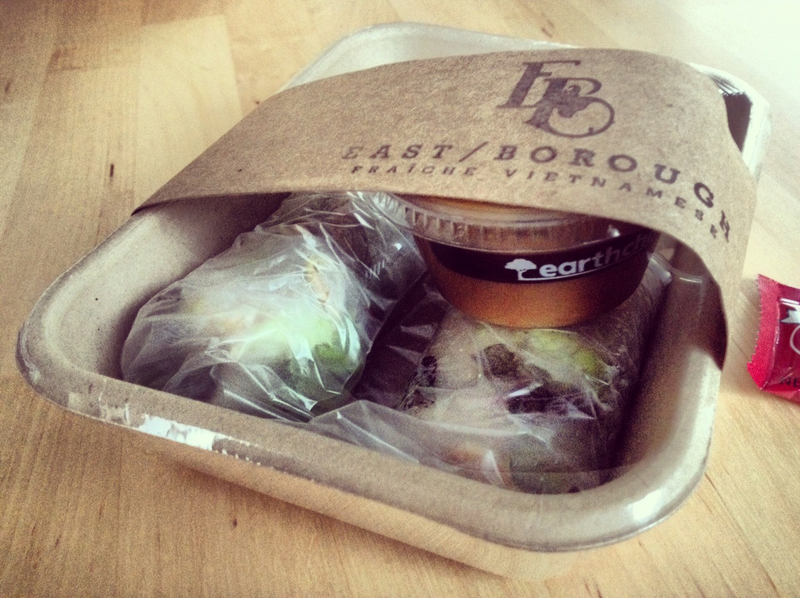 Smart, since their food is photogenic. Right, the food. It's all been good thus far. The Bò Kho Beef Stew Baguette, one of their three Signature Baguettes, was the perfect marriage between a Bánh Mì and my mom's winter beef stew, complete with the bite-size chunks of potato and carrot. While I have yet to compare East Borough's sandwiches to those in Westminster and Garden Grove, the mother of all Little Saigons, and Houston, of course, I have no complaints about this place, except for the FRAÎCHE VIETNAMESE slogan (?). Would have been better SANS. East Borough assumes you want jalapeño, so if you don't (I don't), remember to ask them to leave it out. I've forgotten both times and have had to dissect my sandwich, which only prolongs the wait for that first bite. For the most part I don't like grocery store bouquets. But in trying to break away from my purist if somewhat bland choices, I purchased Trader Joe's $5.99 "Designer Mix" and broke it up into four different arrangements for four rooms in the apartment. The arrangement above, on the kitchen table, is the largest of the four and my favorite. The glass cylinder, from Vons, doesn't distract the eye. Evocative of an English garden, the small, languid bouquet has an effortless appeal. If the flowers were hair they would be the messy ponytail.In the bathroom I've placed a small bunch of daisies in a small cup that until today has been collecting dust for years. I think it's a Seletti cup, the ceramic or porcelain cup that looks crumpled, but it was a gift so I'm not sure. In the bedroom, I've placed a couple of lilies that have yet to bloom in a square glass vase. And in the living room, a couple of unidentified violet flowers in a sake bottle add a touch of color to the white coffee table. Later this month I'm moving to Costa Mesa, within walking distance from the "SoBECA District." "SoBECA" is an acronym for "South on Bristol Entertainment, Culture and Arts," which doesn't really make sense. But moving on. SoBECA's two big features are The LAB ("Little American Business") and The CAMP, which are located across from each other along South Bristol and anchor this Orange County anomaly. And I can't figure out what I think of them. A self-proclaimed "antimall," The LAB is out to combat retail monotony, but with an Urban Outfitters. The CAMP is out to bliss you out, as evidenced by the white painted messages in every parking space, which are a bit too...cutesy. And unfortunately for these two landmarks, The LAB's website design smells of my sister's old Sassy magazines, and The CAMP's could be a website for Fair Trade coffee circa 2002.